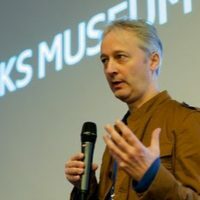 Peter Gorgels is the Internet Manager of the Rijksmuseum, including the museum’s website, Rijksstudio and the app. Gorgels was responsible for developing the museum’s e-strategy and for the major redesign of the Rijksmuseum website, which coincided with the museum’s reopening after extensive renovations. Het is also manager of the new Rijksmuseum app. Gorgels is always looking for innovative ways to improve the interaction of the audience with the masterpieces of the Rijksmuseum.